Geological maps are indispensable exploration tools that can be used for many different purposes. There are numerous ways to improve your geological knowledge, and answer specific questions about a region, through mapping the geology. The focus can be on structures, lithologies, or rather alteration. At different scales, with a quick turn-around when required, or eye for detail instead, Geosense can provide a solution that suits your needs. Most regions have been geologically mapped at least once in the past century, but there are large differences in the quality of these maps. Aspects of most maps could see significant improvements, particularly on the structural side. 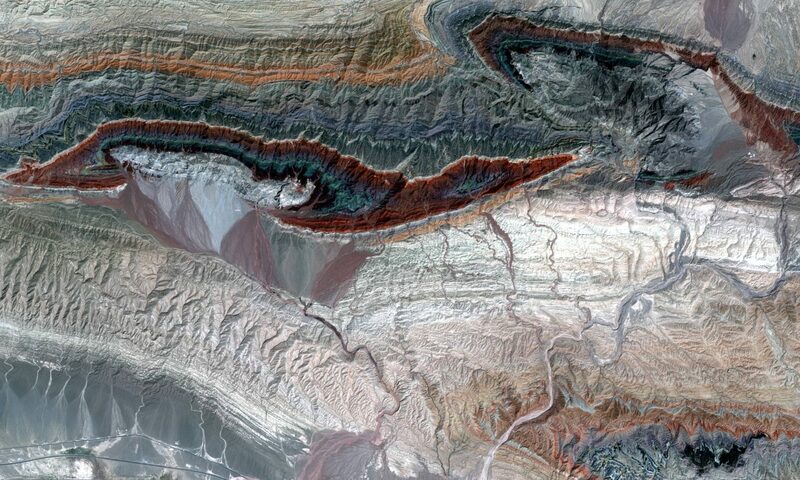 These geological structures often control the locations and geometries of mineral deposits and oil & gas fields. So mapping faults, folds, shear zones, veins, lineaments and other structures can significantly improve the understanding of prospective regions. This will help you focus your exploration efforts in the right locations. Geosense projects normally start with satellite imagery. Satellite data has seen swift development over the past decade, better data is now available cheaper than ever before, which makes this a cost-effective exploration tool. Lots of work can already be done with freely available imagery, and if more detail is required, Geosense will give advice on, and provide you with the best data options, including airborne/drone data and handheld spectrometer studies in the field, where that level of detail is needed. When mapping, observation of the imagery is key. Thanks to the difference in perspective and scale, satellite data shows structures that are invisible when out in the field. The trained eyes and ample experience of the Geosense geologists will help you increase your understanding of the surface geology as well as provide key insights into the subsurface. We will help you recognize prospective provinces along strike from known deposits. In many areas there are large, deep structures that only have an indirect surface expression. These structures often control the location and geometry of big mineral deposits and petroleum fields. Or we will map individual structures, and subtle changes in lithologies, at a prospect scale. Satellite mapping can be done on a standalone basis, or in combination with and/or in preparation of other exploration methods. Field work and sampling programs, gravity, magnetics, seismic, they can all benefit in different ways from the use of and integration with satellite data. Geosense will gladly help you with data integration, combining satellite interpretations with whatever other datasets you may have, or are planning to acquire. To discuss any of these topics, please don’t hesitate to reach out to us (see contact details below).